Background and purpose Intravenous thrombolysis with tissue plasminogen activator is standard treatment in acute stroke today. The benefit of endovascular treatment has been questioned. Recently, studies evaluating endovascular treatment and intravenous thrombolysis compared with intravenous thrombolysis alone, have reported improved outcome for the intervention group. The aim of this study was to perform a meta-analysis of randomized controlled trials comparing endovascular treatment in addition to intravenous thrombolysis with intravenous thrombolysis alone. Methods Databases were searched for eligible randomized controlled trials. The primary outcome was a functional neurological outcome after 90 days. A secondary outcome was severe disability and death. Data were pooled in the control and intervention groups, and OR was calculated on an intention to treat basis with 95% CIs. Outcome heterogeneity was evaluated with Cochrane's Q test (significance level cut-off value at <0.10) and I2 (significance cut-off value >50%) with the Mantel–Haenszel method for dichotomous outcomes. A p value <0.05 was regarded as statistically significant. Results Six studies met the eligibility criteria, and data from 1569 patients were analyzed. A higher probability of a functional neurological outcome after 90 days was found for the intervention group (OR 2, 95% CI 2 to 3). There was a significantly higher probability of death and severe disability in the control group compared with the intervention group. Conclusions Endovascular treatment in addition to intravenous thrombolysis for acute ischemic stroke leads to an improved clinical outcome after 3 months, compared with patients receiving intravenous thrombolysis alone. A meta-analysis by Fargen et al14 showed improved outcome for endovascular treatment compared with medical management in acute ischemic stroke. Since the publication of this recent meta-analysis, several new RCTs have been published, highlighting the need for an updated meta-analysis in the field of neurointerventional treatment in acute ischemic stroke. The aim of this study was to perform a meta-analysis of current eligible RCTs comparing endovascular treatment in addition to IV thrombolysis with IV thrombolysis alone, in order to evaluate and quantify the aggregated benefit for mechanical thrombectomy in acute ischemic stroke. Only RCTs were considered for inclusion. The intervention group was endovascular treatment in addition to IV thrombolysis, and the control group was IV thrombolysis. Only complete studies published in whole were included. Only studies with at least two-thirds of all participants receiving IV thrombolysis were considered for inclusion. There were no restrictions in study language, study age, included patient age, imaging criteria, or National Institutes of Health Stroke Scale (NIHSS) score. We searched PubMed, the Cochrane Central Register of Controlled Trials, and the National Institutes of Health Clinical Trials from the date of inception until 17 April 2015. Two searches were performed. The first search terms were ‘thrombectomy' and ‘thrombolysis'; the second search terms were ‘endovascular treatment', ‘stroke’, and ‘randomized'. All manuscript titles were assessed and eligible abstracts were read. Manuscripts to be read in whole were selected from abstracts that fulfilled the inclusion criteria. Manuscripts found in references lists from read manuscripts were also assessed for possible inclusion. Two independent reviewers assessed the retrieved manuscripts for possible inclusion in the meta-analysis. Any disagreements were resolved by discussion. Two independent reviewers extracted data from the included studies from the published manuscripts, study protocols, and appendices. The primary specified outcome was the proportion of patients with an mRS score of 0–2 at 90 days from stroke onset. Secondary outcomes included mRS 0–1 at 90 days, mRS 0–3 at 90 days, mortality at 90 days, intracerebral hemorrhage within 90 days, and mRS 5–6 at 90 days. To maintain high homogeneity between the included studies, a subgroup of patients in the Interventional Management of Stroke-III (IMS-III) trial that did not have vessel occlusion on imaging were excluded from further analysis. Data were treated according to the intention to treat analysis, and randomized patients remained in their first allocated treatment arm in the outcome analysis. Data from patients lost to follow-up were imputed with mRS 5 in order not to overestimate the treatment effect in studies with a higher percentage of dropouts. Two independent reviewers performed the statistical analyses (Review Manager, RevMan, V.5.3., Copenhagen, The Nordic Cochrane Centre, The Cochrane Collaboration, 2014). Review Manager was used for data presentation. Data were pooled in the intervention group and the control group. Outcome heterogeneity was evaluated with Cochrane's Q test (significance level cut-off value at <0.10) and I2 (significance cut-off value >50%). A p value <0.05 was considered statistically significant. The Mantel–Haenszel method was used for dichotomous outcomes with fixed effect or random effect (DerSimonian and Laird15) where appropriate, according to outcome heterogeneity. OR with 95% CI were calculated for all outcomes. All trials were randomized 1:1, except IMS-III, which was randomized 2:1, with more patients in the intervention group. All trials were prospective randomized, open label, blinded end-point with intention to treat analyses. Extending the Time for Thrombolysis in Emergency Neurological Deficits-Intra-Arterial (EXTEND-1A) also included target group analysis. Study quality details are presented in the online supplementary table S1. In total, the six RCTs randomized 1943 patients to either the intervention group (55%) or the control group (45%). Study characteristics are shown in table 1. In all studies both the intervention group and the control group received IV tPA if eligible. Time from symptom onset to treatment with IV thrombolysis varied from <3 h in IMS-III to <4.5 h in the other trials. In Randomized Trial of Revascularization with Solitaire FR Device versus Best Medical Therapy in the Treatment of Acute Stroke Due to Anterior Circulation Large Vessel Occlusion Presenting within Eight Hours of Symptom Onset (REVASCAT), patients presenting with acute stroke without signs of revascularization after 30 min of IV tPA, or patients not eligible for IV tPA, received either thrombectomy or medical care. A detailed description of the patients in each trial, divided into an experimental group and a control group, is presented in the online supplementary table S2. Median or mean age of the patients in all groups varied from 65 to 71 years. Median NIHSS score (0–42, higher score indicates more severe stroke symptoms) was 13–18. The intervention group received endovascular treatment if eligible (77% in EXTEND-1A to 100% in IMS-III). Full intervention group characteristics are presented in table 2. Control group characteristics are presented in the online supplementary table S3. Overall, all patients in Solitaire with the Intention for Thrombectomy as Primary Endovascular Treatment (SWIFT PRIME), EXTEND-1A, and the subgroup of patients in IMS-III with vessels occlusion received IV thrombolysis. The percentages receiving IV thrombolysis in the other three studies varied between 78% and 91% in the control groups and between 68% and 87% in the intervention groups. The primary outcome measure, mRS score of 0–2 at 90 days from symptom onset, was favored in the intervention group. The proportion of patients with mRS 0–2 after 90 days was 46% in the intervention group and 27% in the control group (figure 1A). The absolute risk reduction for the intervention group compared with the control group was 19% (95% CI 14% to 23%). Number needed to treat for mRS 0–2 in the intervention group was 6 (95% CI 4 to 7). Results from analyses of secondary outcomes showed a significantly increased proportion of patients in the intervention group with an excellent outcome (mRS 0–1, figure 1B) and of mRS 0–3 after 90 days. There was a significantly reduced risk of mortality in the intervention group compared with the control group, with an absolute risk reduction for death of 4% (95% CI 1% to 8%) in the intervention group. The number needed to treat in the intervention group to avoid one death was 23 (95% CI 12 to 149). There was a significantly higher probability for severe disability and death in the control group (table 3). There were no differences regarding symptomatic intracerebral hemorrhage between the intervention and control groups. To more specifically evaluate the effect of stent retrievers on stroke outcome, we performed a sensitivity analysis excluding the IMS-III trial due to its limited used of stent retrievers. In general, the outcomes for the intervention group improved after exclusion of the IMS-III trial (figure 1C, D). The proportion with a functional outcome (mRS 0–2) in the intervention group was 47% and 26% in the control group, with an absolute risk reduction of 21% (95% CI 15% to 26%) in the intervention group and a number needed to treat of five patients (95% CI 4 to 7). There was no statistically significant differences in mortality or intracerebral hemorrhage between the intervention and control groups in the sensitivity analysis. Comparisons between the outcomes are presented in table 4. Forest plot of the modified Rankin Scale (mRS) in the intervention and control groups. (A) OR of mRS 0–2 (functional outcome) in the intervention and control groups after 90 days. (B) OR of mRS 0–1 (excellent outcome) in the intervention and control groups after 90 days. (C) OR of mRS 0–2 (functional outcome) in the intervention and control groups after 90 days, excluding IMS-III. (D) OR of mRS 0–1 (excellent outcome) in the intervention and control groups after 90 days, excluding IMS-III. Studies: ESCAPE, Endovascular Treatment for Small Core and Anterior Circulation Proximal Occlusion with Emphasis on Minimizing CT to Recanalization Times; EXTEND, Extending the Time for Thrombolysis in Emergency Neurological Deficits; IMS-III, Interventional Management of Stroke-III; MR CLEAN, Multicenter Randomized Clinical Trial of Endovascular Treatment for Acute Ischemic Stroke in The Netherlands; REVASCAT, Randomized Trial of Revascularization with Solitaire FR Device versus Best Medical Therapy in the Treatment of Acute Stroke Due to Anterior Circulation Large Vessel Occlusion Presenting within Eight Hours of Symptom Onset; SWIFT-PRIME, Solitaire with the Intention for Thrombectomy as Primary Endovascular Treatment. 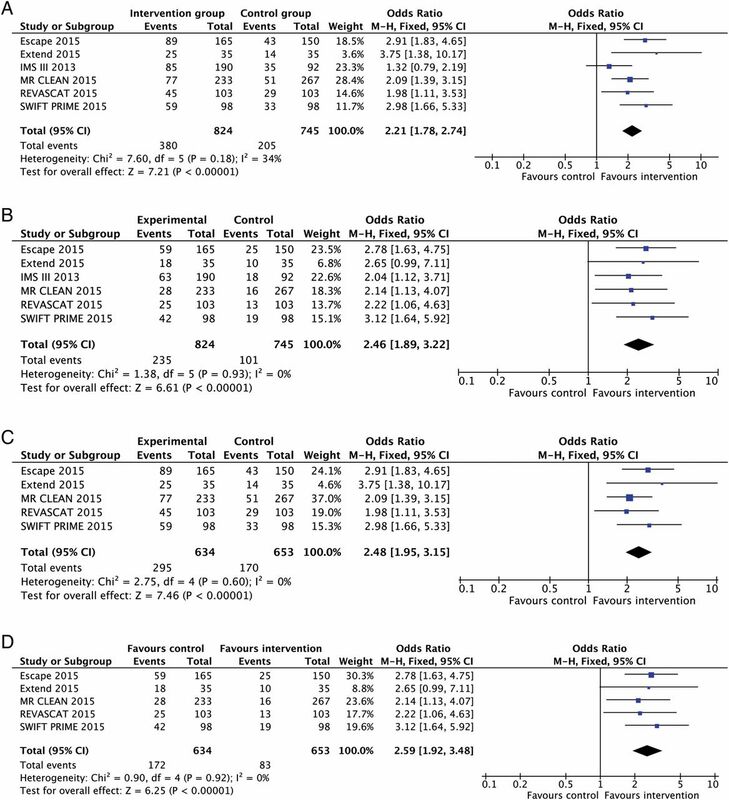 In this meta-analysis, we analyzed six RCTs with 1569 patients, evaluating the outcome in patients with acute ischemic stroke with a documented occlusion who received either IV thrombolysis (control) or IV thrombolysis plus endovascular treatment (intervention group). The aim of this meta-analysis was to evaluate the role of endovascular treatment, in particular for stent retrievers, in acute ischemic stroke. Our results indicate that treatment with endovascular treatment, including mechanical thrombectomy, leads to a higher ratio of patients with an improved clinical outcome after 3 months from stroke onset compared with the control group receiving IV thrombolysis alone. Patients receiving IV thrombolysis alone had a higher probability of mRS 5–6 and death after 3 months; this has not been shown in previous single RCTs. However, this was not significant when the IMS-III trial was excluded. There were a number of differences between the six trials. The IMS-III trial included patients over 8 years and used several different devices for mechanical thrombectomy, due to the technological and scientific evolution of stent retrievers during the study period.8 ,9 Percentages of patients in the intervention groups that received mechanical thrombectomy varied between trials. In the IMS-III trial, only 39% received mechanical thrombectomy in the intervention group. This was due to inclusion of patients without a CT angiography verified vessel occlusion. After confirmed vessel occlusion on CT angiography was used as an inclusion criterion, all patients in the intervention group received endovascular treatment. This was adjusted for in our analysis by using patients from the cohort of CT angiography verified vessel occlusions. Study heterogeneity decreased after inclusion of only CT angiography confirmed vessel occlusion from the IMS-III trial. There was wide use of stent retrievers among the RCTs, except for the IMS-III trial. To more specifically evaluate clinical outcome after treatment with stent retrievers in combination with thrombolysis, we compared the five included RCTs after exclusion of the IMS-III trial in a sensitivity analysis. Excluding the IMS-III trial yielded a higher OR for functional and excellent outcome after 3 months, and a higher probability for a poor outcome (mRS 5–6) in the control group. Time to intervention varied between included studies, with longer time to intervention in REVASCAT and Multicenter Randomized Clinical Trial of Endovascular Treatment for Acute Ischemic Stroke in The Netherlands (MR CLEAN). Poorer result in clinical outcome in these two studies compared with ESCAPE, EXTEND, and SWIFT PRIME might be attributed to longer time to reperfusion and higher proportion of patients with successful recanalization, and emphasizes the importance of time in acute stroke care. The generalizability of these results requires some caution. Included patients in these trials were a highly selected group and represent a small fraction of all stroke patients. Only 5–13% of all stroke patients present to hospital within the time window for thrombolysis. Contraindications for IV thrombolysis further reduce the number of eligible patients.21 For example, a total of 7798 patients presented with acute ischemic stroke and were assessed for eligibility in the EXTEND-1A trial; 1044 of these received IV tPA, but only 70 patients were enrolled in the study. Major reasons for exclusion after treatment with systemic thrombolysis was lack of occlusion of a major vessel, out of operating hours, or poor premorbid condition. A limitation of this meta-analysis is the lack of individual patient data for patients lost to follow-up, which might affect the results of the outcome analyses. Lack of individual patient data limits the possibility of subgroup analyses of patients with different clinical characteristics. Secondly, no specific search of unpublished studies was performed, possibly introducing a risk of publication bias. Although all included studies were of high scientific quality, the risk of bias due to funding from industry grants is not negligible. Considering that five of the six RCTs only included occlusions in the anterior circulation, this might also limit the generalizability of the results to patients with ischemic stroke in the posterior circulation. Furthermore, long time follow-up from these RCTs needs to be assessed in order to evaluate the treatment benefits after 3 months. In addition to the six included RCTs, preliminary results from the Trial and Cost Effectiveness Evaluation of Intra-arterial Thrombectomy in Acute Ischemic Stroke (THRACE) trial have been presented.23 This is a French multicentre study including, to date, 385 patients. Patients were randomized during IV thrombolysis treatment into intervention or no additional treatment. Including these results in the meta-analysis yields an OR for functional outcome of 2 (95% CI 1 to 3), favoring intervention, with a numbers needed to treat of 8 (95% CI 6 to 10). Patients with acute stroke treated with IV thrombolysis and additional endovascular treatment with mechanical thrombectomy show improved functional outcome and lower mortality after 3 months from stroke onset compared with patients receiving IV thrombolysis alone.
. Endovascular treatment for acute ischemic stroke patients: implications and interpretation of IMS III, MR RESCUE, and SYNTHESIS EXPANSION trials: a report from the Working Group of International Congress of Interventional Neurology. J Vasc Interv Neurol 2014;7:56–75.
. THRACE STUDY:Intermediate analysis results. European Stroke Organization Conference; 18 Apr 2015, Glasgow, Scotland. AnF-D and AlF-D contributed equally. Contributors AnF-D and AlF-D contributed equally to this study. AnF-D and AlF-D planned the work, and were responsible for data collection, analysis, and interpretation, and writing of the manuscript. JF performed the statistical analysis and critically revised the content. ÅKS interpreted the data and critically revised the manuscript. All authors approved the final version and agreed on the integrity of the work.